IRVINE, CA (May 19, 2017) – Garbanzo Mediterranean Fresh is hosting an epic, month-long celebration in honor of International Falafel Day. 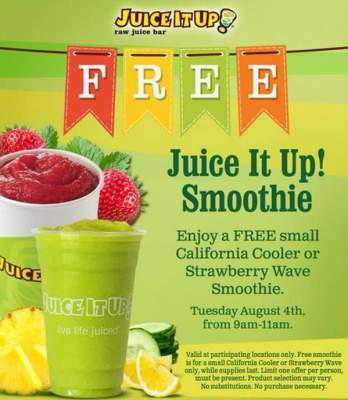 IRVINE, California (August 22, 2016) – Juice It Up!, one of the nation’s leading raw juice bar and hand-crafted smoothie chains, is excited to introduce Tasty Treat Combos featuring three new, kid-friendly smoothies paired with a bag of chips or pretzel bites, along with a glow in the dark wrist band. Designed with kids in mind, the three new smoothies, served in 12 oz. portions, are both dairy and gluten free. The Farmers Market at the Orange County Great Park is moving to a new location as of Sunday, July 17. The Farmers Market will now be conveniently located adjacent to the Palm Court and other Great Park amenities including the Carousel and the Great Park Balloon. Houston, TX (June 21, 2016) – Muscle Maker Grill®, the rapidly expanding fast-casual restaurant brand, promoting a healthy lifestyle by offering nutritious alternatives to traditional dishes, today announced it will officially open its first two corporately-owned and operated west coast locations in Santa Ana on Tuesday, June 28 and Irvine on Thursday, June 30. To celebrate the occasion, the health-conscious brand famous for serving lean, protein-based dishes including fresh greens, healthy wraps, fit bowls, skinny flatbreads, fruit smoothies, protein shakes and more, will give away FREE meals for one year to the first 50 guests in line on opening day. Whole Foods Market – the first national Certified Organic grocer in the United States – has partnered with global public health alliance My City Bikes to present the first national group bike ride to the grocery store. “Biking with Whole Foods Market” is a proprietary group bike ride experience to help beginner cyclists learn safe routes to their local Whole Foods Market and how to bike with groceries. Celebrating Pizza 90’s One year Anniversary in Irvine! IRVINE, Calif. (Feb. 11, 2016): The City of Irvine, in partnership with Second Harvest Food Bank, will host Irvine Has Heart, a community food drive, from Feb. 12 through March 31. The goal of the drive is to collect 3,500 pounds of canned food to help families and seniors in need. Philly’s Best, SoCal’s destination for authentic Philly Cheesesteaks and Hoagies, is rolling into 2016 with Meatball Mania! Back by popular demand, fans can now enjoy authentic Philly Meatball Sandwiches at all Philly’s Best locations through March.